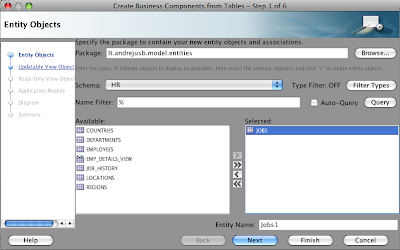 JDeveloper 11g together with Oracle ADF provides fully functional LOV component, in 11g you can define LOV in Model, for specific attribute in View Object (ADF BC). However, at the moment there is problem with non-model LOV, main problem - Search region for non-model based LOV not available. 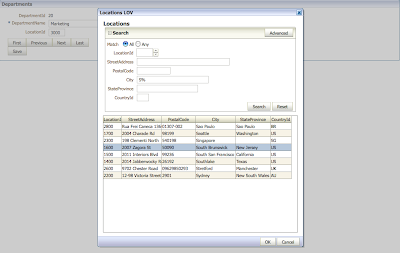 For example, you can check my previous sample application, developed with JDeveloper 11g TP3 - List-Of-Values Component in Search and Edit Form. In this application, I was using non-model LOV, it was based on variable in Page Definition. 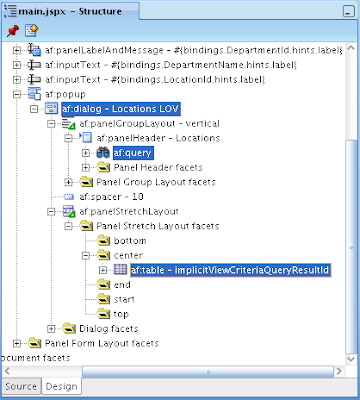 However, same type LOV appears differently in JDeveloper 11g TP4 - without Search region, and its not clear if it will have Search region in next release. You can download my sample application - CustomLOV.zip. This application demonstrates how to implement own LOV functionality. Next step will be to implement custom ADF reusable component for LOV. Similar as Glasspane ADF reusable component - Glasspane in ADF Faces RC. Now I will describe main steps, you can follow if there will be a need to have custom LOV type functionality. 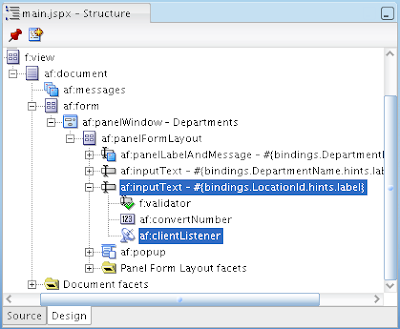 First, we need somehow to open dialog window, it can be done relatively straightforward - to put af:clientListener operation on selected af:inputText field and specify dbClick type for this action. This will allow to raise popup with LOV when dbClick event will be catched. Main trick in this application is applied for row selection from LOV. Its not a problem to select row and return it by pressing OK button. 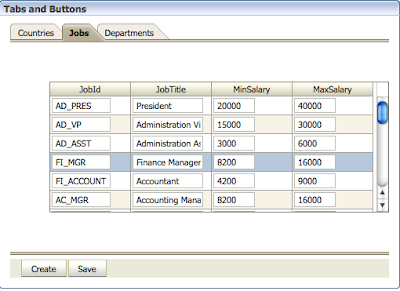 But, its little bit more complex to return selected row just by double clicking on any row. Its a problem, because selection event is fired on single selection click, but not on on double click. 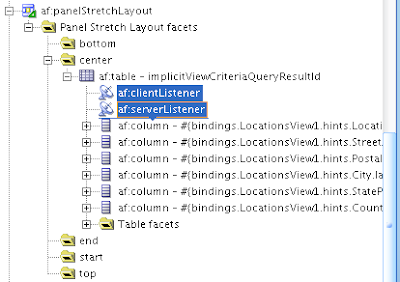 However, you shouldn't forget - we are using ADF, almost all problems can be solved here ;) So, what i did - I have set af:clientListener with dbClick type for Results table and additionally have set af:serverListener for the same Results table. First function is responsible for popup with LOV invocation, second reacts to dbClick event in Results table. 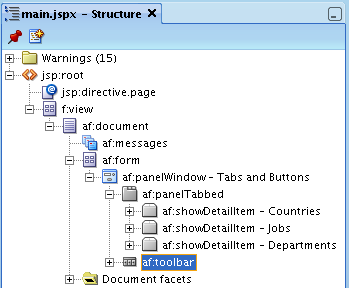 You will face a problem with this structure, when there will be requirement to display different sets of buttons based on different tab (in Oracle ADF, currently opened tab is called - disclosed). This means, area with buttons should be updated, each time user changes current tab. 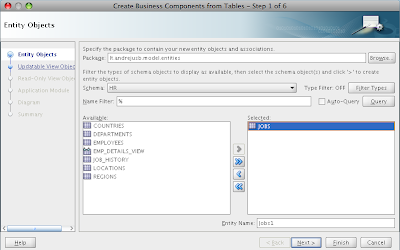 You can download sample application, where described case is implemented - TabsButtonsDynamic.zip. 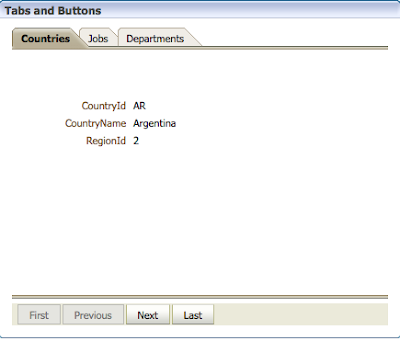 This sample contains three tabs - Countries, Jobs and Departments. Based on tab currently selected, different buttons are rendered. However, all buttons are initially created on the page, just rendered conditionally. 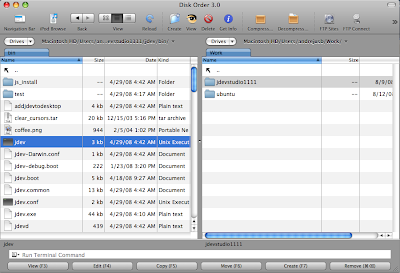 In this case, we can use the same DisclosureListener for all Tabs. 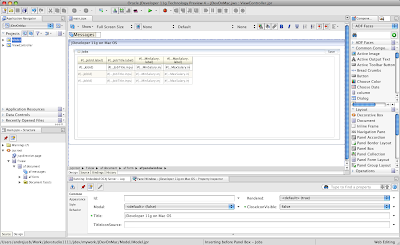 Generated DisclosureListener method will contain only one line of code - it will refresh af:toolbar area with buttons. 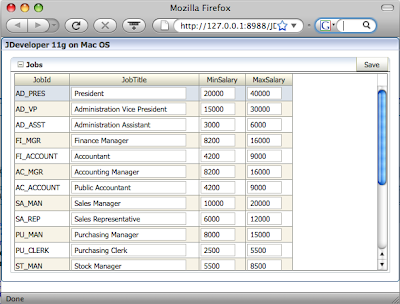 As you have noticed, there is no need to refresh each button individually, its enough to apply partial target to toolbar. 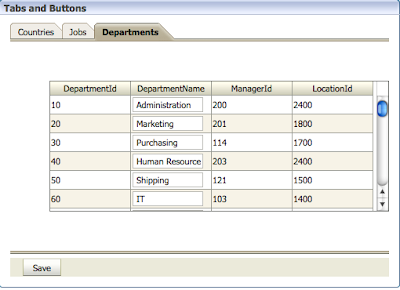 Each button should have conditional Rendered property. This property will return boolean value based on currently disclosed tab. Thats all, really simple and straightforward solution. Today I got email from Oracle people about Oracle ACE "Office Hours" activity in the OTN Lounge during Oracle OpenWorld 2008. Main idea of those "Office Hours" is to create opportunity for Oracle ACE's and Oracle ACE Directors to meet with conference participants and to answer possible questions. You can build very cool systems, based on excellent architecture design, with ADF BC or EJB in Model layer and with ADF Task Flows in View Controller layer. However, when it comes time for functional test, tester can break all things only with one question - why when I pressed Apply button and at the same time have pressed couple of other buttons, I got some unexpected result? Well, you probably will answer - you need to wait after Apply button is pressed some minute until operation will be finished and only after it will be done you can press other buttons. I'm sure, tester will not be satisfied with such answer, and application will not be accepted. However, things are not so bad as you can imagine, Frank Nimphius have described how to block page screen during long operation - How-to build a reusable Glasspane in ADF Faces RC. Please read Frank's article, before reading my post, since current post is completely based on it. Here I will describe with sample application how to refresh the screen to show the visual results of the long running operation. In onAction(ActionEvent actionEvent) method, I'm storing Id of button component that currently activates Glasspane. I'm doing this, in order to know what logic should I invoke in queryToLaunch(ClientEvent evt) method. When Glasspane component is activated, it calls back queryToLaunch(ClientEvent evt) method. In this method I'm accessing stored variable with currently pressed button Id and invoking appropriate functionality. Additionally, in ADF Faces RC its possible to use Blocking=True property for buttons. However in most cases its not useful, since user still can do changes on the screen. While integrating Glass Pane solution into our project, JDeveloper/ADF developer have found nice improvement. Instead of using refreshCurrentPage() method you can set PartialTriggers property for af:form tag and indicate dependency with Glass Pane popup (for example, in my sample application it will be - af:form partialtriggers="gp:busyPopup"). With this setting, page content is refreshed after popup is closed, without rerendering full page.